Roald Dahl (13 September 1916 – 23 November 1990) was a British writer. Roald Dahl was born in Llandaff, Cardiff, Wales to Norwegian parents. He was educated in England and then worked in Africa for Shell Oil Company. In the Second World War, he was an RAF fighter pilot. It was after an air-crash and "a monumental bash on the head" that he began to write. The crash was the subject of his first published story, "Shot Down Over Libya". His stories are full of huge, wild ideas and he hoped they would help children to learn to love books. He is one of the world's most popular children's writers. 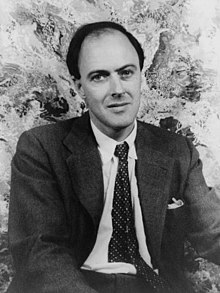 Dahl wrote many famous children's stories and adult horror stories. Many of his books and stories have been made into films and TV shows all over the world. Among his most popular books are Charlie and the Chocolate Factory, James and the Giant Peach, Matilda, The Witches, The BFG, Fantastic Mr Fox , and Kiss Kiss. Many of his children's books have pictures drawn by Quentin Blake. Dahl was married to Patricia Neal from 1953 until they divorced in 1983. They had four daughters (one of whom died before them) and a son. Dahl was married to Felicity Crosland from 1983 until his death. He lived in Great Missenden, Buckinghamshire. He died on the morning of 23 November 1990 in Oxford, from myelodysplastic syndrome, aged 74. Model Sophie Dahl is his granddaughter. There is a Roald Dahl Museum and Story Centre in Great Missenden which shows the great works of Dhal. ↑ 1.0 1.1 "Roald Dahl (British author) -- Britannica Online Encyclopedia". britannica.com. Retrieved 26 July 2010. ↑ Shavick, Andrea (1997). Roald Dahl The Champion Storyteller. OXFORD: Oxford University Press. p. 14. ISBN 9780199119615. Wikimedia Commons has media related to Roald Dahl. This page was last changed on 28 March 2019, at 04:03.